Someone defaced a famous D.C. mural of Bill Cosby, replacing the comedian’s face with that of North Korean leader Kim Jong Un -- but the defacement didn't last long. The mural at Ben’s Chili Bowl's flagship location on U Street NW shows Cosby and President Barack Obama, two people permitted to eat there for free, the restaurant boasts, as well as other D.C. legends musician Chuck Brown and radio host Donnie Simpson. The news that Kim's face was placed over Cosby's was first reported by the news website Borderstan. Street artist Smearleader took credit for the defacement on Instagram, writing, "Instead of looking at a sexual predator, people can celebrate in jubilation that the great leader is now on the their Wall." "What I would like for people to take away from this particular event is that it is an embarrassment to residents of D.C. old and new that [Cosby's] face is still up on the wall mural," Smearleader told News4. Shortly before 5 p.m. Monday, Kevin Irvine, who said he was friends with the mural artist went to the scene and removed the label of Kim's face, restoring the mural to display Cosby again, News4's Shomari Stone reported. When asked what he would tell someone who'd say that Cosby doesn't belong on the mural, the man responded, "Oh, that's impossible. Anybody who would say that is just insane. Regardless of Bill's -- I'm not sure what he did -- but he's a very respected man." Ben's had declined to take the mural down after dozens of women came forward with accusations Cosby drugged them and sexually assaulted them. The comedian, who has never been charged with a crime, is a longtime supporter of the restaurant and appeared at the opening of its Arlington location in March 2014. "You've seen Bill Cosby wherever we stood," owner Vida Ali told News4 last year. "He's been a big supporter of us for a long time. He's been a family friend, and that's still the case." Asked what the biggest issue with Cosby is, Smearleader told News4, "'The Cosby Show' is debatable, but definitely the drugging and sexually taking advantage of women." 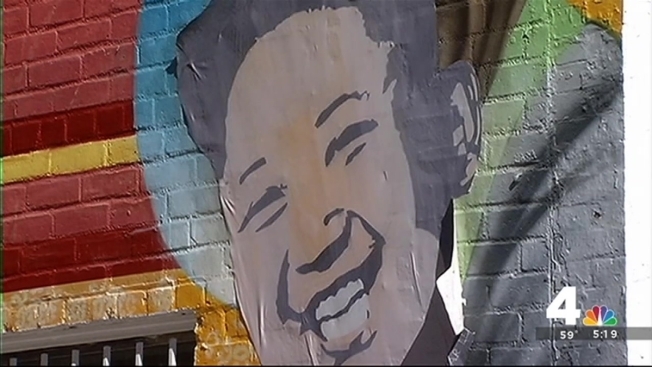 Smearleader is known for putting stickers of the North Korean leader on street signs. The street artist told News4 that he ate at Ben's about 10 years ago. "Employees were nice and courteous, so this isn't a knock on them," Smearleader told News4. "They're just trying to do their job."